Even after presence of many OS in the mobile world, the most used one is none other than “Android”. Almost every third guy in the room uses an android mobile phone. And statistically speaking there are around 1.5 billion mobile devices actively running android OS right now. And most of us have locks on their phones, either password / pin protected or the new day finger sensors. But, what happens when on one fine day we woke up and not remember the phone lock? Bewildered, we would be right! Rushing towards a nearby service station to get the phone rooter or unlocked anyhow ASAP. But, there’s a secret tool that can help you unlock your phone in minutes. So, lets dive into our guide on how to download Android Multi Tools v1.02b for Free and then how to use it. Now you must be wandering, what is this Android Multi Tools v1.02b? It is a beautiful android tool that lets you unlock any android phone at ease. It is very helpful in those cases where we forget our pin/password and don’t want to root the phone so as to save data. So read the following guide carefully so that in case such incident happens in your or near one’s life; then you can handle it smartly via Android Multi Tools v1.02b. Also known as the pattern lock remover tool, Android multi tools v1.02b saves much effort while unlocking android phones. However, there are always some steps (or say) pre-requisites that we need to be sure of before using the tool. All brands smartphones are supported by the tool, but they must be running on Android OS only. You must have a computer with Windows XP/Vista/7/8/8.1/10 installed. The mobile phone should be in “ABD Mode“. Internet Connection to download the tool. Therefore, in order to recover the lost pin / password, one must have an ADB (android debug bridge) installed on the system (desktop/laptop). As the name suggests, we need ADB to transmit Linux and android developer commands to the android phone. Next, you should download the Android multi tools v1.02b itself. Follow the link. 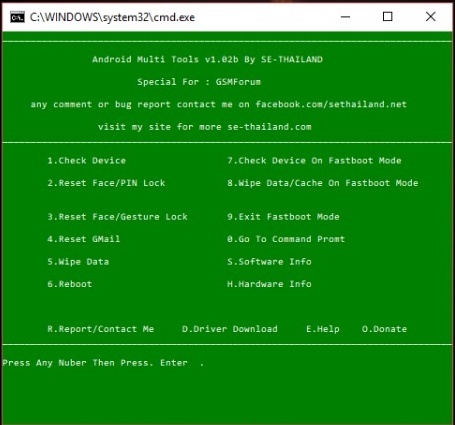 Now let’s look upon some cool features that come with Android Multi Tools v1.02b. Undoubtedly the best tool to unlock pin/password of any android smartphone. No special preset knowledge needed to use the tool. It lets you check the device status. The latest version is also compatible to reset gesture or face lock. The tool can help you to swipe out all the data from any android smartphone. You can reboot the device in just a “click”. You can check device status in fastboot mode also. It also helps you to wipe data and cache in fastboot mode. Suppose you realize suddenly that fastboot mode isn’t for you; then exit the fastboot mode in a single click. 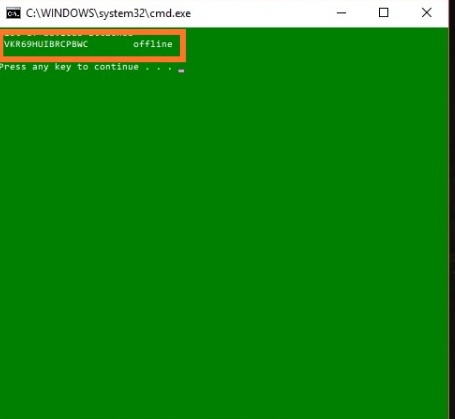 The tool can launch command prompt in a single click too. Also, being a multi tool it helps you to check all the hardware and software info of the android device connected. As mentioned before, there isn’t much trouble that you have to face to unlock your phone via Android Multi Tools v1.02b. Just have a look on the following steps mentioned and you’ll be on the go instantly! No secrets, the very first step would be to Download the software. Then open the downloaded file and extract it to any preferable location on your system. After that install the extracted file and then click on the Android Multi Tools v1.02b.exe. Meanwhile, the installer is running, you enable developer option in your android mobile phone and there turn on the “USB debugging” option. After the installation, connect the android smartphone to the system. As per your system setting, a popup would come asking permissions to run the installed tool; no harm in that so grant all. Then the interface of Android Multi Tools v1.02b will open up and we can start working. Press 1, if you want to check device status or basic information like device ID, IMEI number etc. Press 2, to directly reset the pin or password lock of the phone. Mainly we are here for this step only! So, by hitting 2, you can remove the pin / password lock from the smartphone attached. Press 3, to wipe gesture / face lock, if you are using a trendy android device. Press 4, to reset the Google ID linked with the device. Press 5, to swipe out any data from the device and let it feel fresh. Press 7, to check device status in fastboot mode. This one is mostly helpful for people using custom Roms. We hope that the guide was easy and helpful for the fateful days of our android smartphones. Moreover, try to keep your precious devices safe not only by locking the device; but keeping it safe in physical manner. Yes for sure, this tool is very useful in case when we forget our hone locks, but it might be a bad sign for some also. 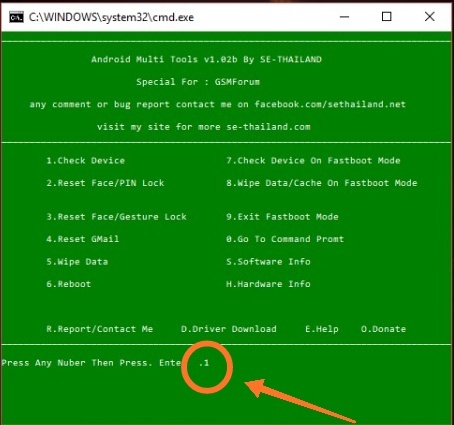 In case you drop your phone somewhere or a pick-pocketer gets hold of your luxurious android smartphone; then using this tool that person might be able to reset the phone / wipe old data. stay safe and keep enjoying the android world!